If you are just starting to hunt or have been doing it for a while, you may realize that sometimes, knowing the distance between you and your prey is a valuable piece of information. This will let you calculate how much closer you must move to get an accurate shot and to make sure that you don’t miss. By using a rangefinder binocular, you will be able to get this distance while being able to see your target up close as if you were right in front of it. Not only will you be able to tell the distance between you and your target, but you will also be able to determine the size, allowing you to adjust your strategy accordingly. When you are choosing your rangefinder binoculars for your next hunting trip, you may realize that it isn’t as easy as you might have thought. This is because of the wide variety of rangefinder binoculars available with different features available in each one. When choosing your binoculars, we recommend that you look at the features, quality, and price, so that you can get the best value out of your purchase and so that you can use your binoculars for the longest time possible. 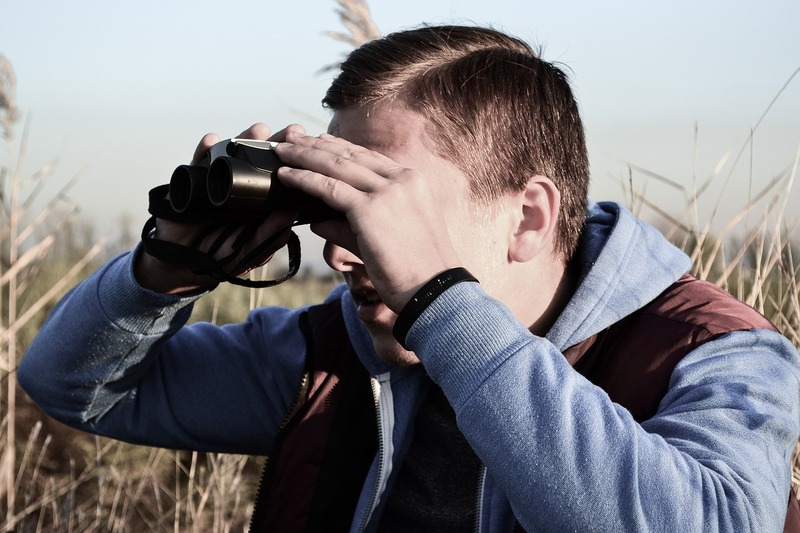 If you are having a hard time choosing a binocular, then we recommend that you check out our recommendations and reviews below, so that you have the option of choosing from an expert recommendation. With these types of binoculars, there are always a few features that should almost always be included. These features are normally the waterproof feature, compass & rangefinder feature, and wide FOV. 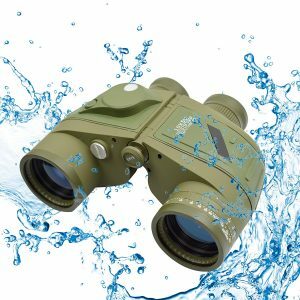 The waterproof feature is highly recommended because you will find yourself in situations where you must get close to water and if your binocular doesn’t have this feature, your binoculars will surely break if you accidentally drop it in the water. The rangefinder feature will also usually come with a compass, so that if you are focusing in on your target, you will also be able to use the compass to get a sense of direction without taking your eyes off your prey. Lastly, the wide FOV is a feature that we highly recommend that you get with your binoculars because it will allow you to have a wider view instead of a tight, restricted view. This will allow you to find your target a lot easier and will also let you track your prey a lot easier as well, especially if it’s fast. 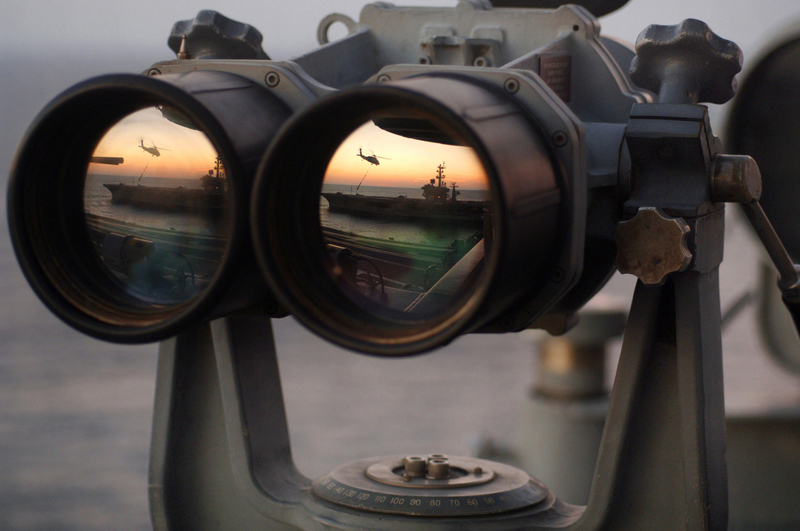 The quality of your binoculars is also an important factor in choosing the right binoculars. 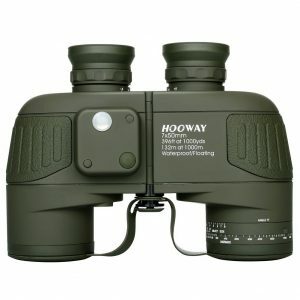 If you are only going to be using your binoculars on a couple of trips, then the quality might not matter as much, but if you are planning to use it for a long time, then you should get a binocular that is built using high quality materials and a high-quality framework, so that it will provide you with a long lifespan. Also, the quality of the binoculars will determine how well the features will perform on a consistent basis, so if you will be using any of the features a lot, then getting a quality binocular is necessary. The price of the binoculars is also important because depending on much you spend, the features and quality you will get will differ. 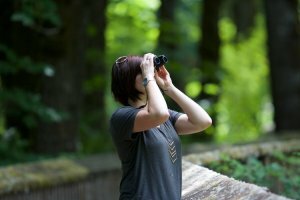 Just like everything else, the more you spend, the better your binoculars will be, so we highly recommend that you go for a quality purchase initially, so that you can save a lot more money later. If you go for a cheaper option, then you might end up spending more than you might want to compared to getting a quality binocular upfront and using it for a long time. Perfect for those looking for a binocular that is suited for all environments, this binocular will provide you with a great view alongside great durability. As this product was designed to be used in rough terrain as well as wet locations, you will be able to hunt without having to worry about your binoculars breaking. Although the price isn’t the most affordable, it is still decent compared to the features and the quality you will be getting with this product, so we highly recommend that you give this product a look as we know you’ll love it. This binocular comes with a lot of features to make your experience a whole lot better. One feature that comes with this product we know you’ll like is the extreme environment adaptability feature. Basically, this feature will allow you to use this binocular in any place you want, whether it be snowing, raining, or rocky, without giving you the pressure of the binoculars breaking. This is because this binocular is built to last through drops, water, and other environmental damage, so that if an accident occurs, your binoculars will stay safe. Another feature that we know you’ll like is the compass and rangefinder feature. With this feature, you’ll be able to know what direction you are facing always without having to take your eyes off the binoculars and you will also be able to determine the size and distance between you and your target. Lastly, this binocular comes with a tripod mount, so if you are going to be in one location for some time, you can use a tripod to get a much more stable view of your target. The quality of this binocular is one of the best that we have seen, mainly due to how durable it is. All the materials that were used to build this product is of high quality and will last a long time to offer you the best experience possible. Also, the optics of this binocular is specialized, meaning that the optics are multi-coated and will come with BaK-4 prisms to offer you a bright and crisp image that you won’t be able to see in other products in this price range. If you are looking for a durable, but quality binocular, then this one is something that we highly recommend that you get. 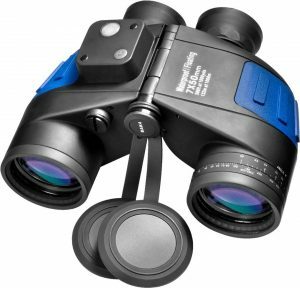 The price of this binocular is one of the weak points to this binocular mainly because it is a bit pricey compared to the other ones on this list. Although it is a bit pricy, the features and quality that come with this product makes this binocular worth the price you pay for it. As you will be able to use this binoculars for a lot longer than other products, you will be able to get value out of this compared to other products in a similar price range or lower. 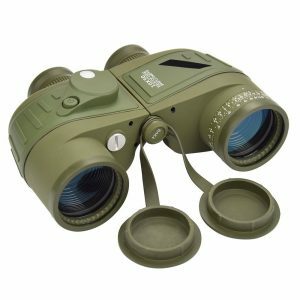 Overall, we loved this product because it is extremely durable, versatile, comes with a wide variety of features, and is a quality binocular overall if you can afford the bit of a premium price tag. Although a bit of a lower quality binocular, if you can’t afford the other products in this list because of the price, then this is a great alternative for you. As one of the best budget rangefinder binoculars that we have seen so far, it comes with a variety of features that will assist you on your next trip. The quality of this product is lower than the others, but if you can take care of it well and not drop it often, then it has the possibility of lasting just as long as the other, more expensive binoculars. This binocular comes with a wide variety of features to make your experience a lot more pleasant. One feature is the wide FOV of this product. With this binocular, you’ll be able to see an outstanding 396 feet while standing at 1000 yards. This will allow you to see a lot more and be less restricted, so that you can find your targets easier and track them a lot easier as well. Another feature that comes with this product includes the waterproof feature. This feature will keep your binoculars alive if you ever drop it in water while you are hunting. As this happens more often than you think, we highly recommend that you get this feature with any binocular that you get. Lastly, this binocular comes with multi-coated optics and BaK-4 prisms to give you a much clearer view in dim environments as well as help transmit more light into your binoculars to give you better contrasting colors. The quality of this binocular isn’t the best that you can get. However, if you take care of the binocular well and you maintain it like you would a very expensive binocular, this one should be able to last just as long as any other premium binoculars. This binocular also comes with a rubber shell coating so that if you ever happen to drop your binoculars, the shock from the impact will be absorbed by the rubber coating and not the binoculars itself. Without this shell, your binoculars will have cracks and dents in a matter of a few drops. The quality of the optics and the focus knob isn’t that great as it isn’t made of the premium quality materials that the other binoculars on this list come with. However, this won’t affect your overall experience as long as you take good care of your binoculars. The price of this product is one of the best parts about this binocular. Although this binocular gives you the features that you want, the magnification that you want, and the toughness that all the other binoculars come with, the price still remains very affordable and a lot cheaper compared to the premium options on this list. If you are on a small budget and you cannot afford any of the other ones, then this binocular is a great alternative because although the quality may not be up to speed, the features and the magnification definitely are. Overall, this product is great if the quality is something that you can get by and you are on a budget as the features are definitely something that is worth of value when compared to the price you are getting it for. If the activity you will be participating will cause you to become very wet, such as whale watching or amphibious hunting, then this binocular is something that you should look at. As this binocular is also a bit more affordable than the premium options available, it is an alternative that you should keep in mind if you have a budget that you would like to stick to. The quality of this binocular is significantly higher than the product reviewed previously with only a slight price difference, so if you are gearing more towards quality and is okay with investing a bit more, then this binocular is for you. However, this binocular is a bit more specialized towards water sports/activities, so define your goals and choose a binocular that fits your needs to get the best value out of your binoculars. A feature that we liked about this product is the complete waterproof and fog proof protection. This will allow you to use this binocular in any environment without having to worry about the weather affecting the quality or the functionality of the binoculars. This is especially helpful if you are going whale watching or hunting because the dew or mist might get into the binocular if it isn’t waterproof or fog proof like this binocular and cause damage to the interior and affect your experience negatively. Another feature that we liked were the multi-coated optics and the BaK-4 prisms because this feature will allow your image to be a lot clearer and sharper. This is because the multi-coated optics help transmit more light, making your view have a lot more contrast. The prisms help keep your view a lot clearer, even in darker environments, making it a feature that should be essential in every binocular. Lastly, this binocular has quite a wide FOV, making it a lot easier for you to find your target and track your prey while hunting. A tighter FOV will make you feel a lot restricted, which is why we highly recommend this binocular for its wide FOV. The quality of this binocular is definitely a lot higher than other products in this price range. The different parts that make up this binocular such as the optics and the adjustment knobs are made out of quality materials and will give you a pleasant experience for a long time. The binocular also comes with rubber armoring as well as a grip on the sides, allowing you to keep your binoculars safer and well protected. This will allow you to use your binoculars for a long time without having to replace it, as you won’t drop it as easily or break it as easily due to the rubber armoring. Overall, the value that you get with this binocular is extremely high because of how long it will last, even in wet environments. So, if you know that you will be abusing your binoculars in your hunting or whale watching trips, then we recommend that you take this binocular a go. The price of this binocular isn’t premium, but it isn’t too affordable either. However, it is just around the middle and is one of the few products that are worth every single dollar you pay for it. This is because of how much value you can get out of this binocular due to the quality and durability you get, alongside the rangefinder feature and the waterproof feature. 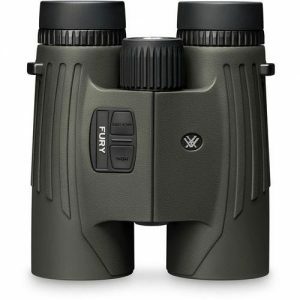 The price is also fairly affordable, making it easy for you to get it if you are pondering whether to increase your budget for a more expensive binocular when you can just get this one with tremendous value instead. In conclusion, we recommend that you get this binocular if you cannot afford any of the premium ones, as you’ll be able to get the similar features and quality, but at a better price point and with better value. The Feyachi 10x50mm Marine Binoculars is one of the best in class rangefinders with a wide measurement range of 396FT/1000YDS, large lens design, and 23MM lens. These provisions in the binoculars make it give one of the most excellent and the most comfortable experience of viewing objects without eye fatigue, dizziness along with a vision combination of wide angle and HD. 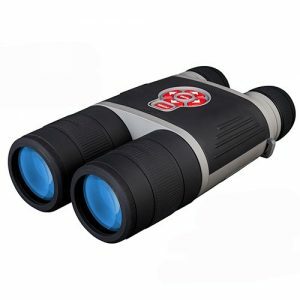 This set of binoculars is sheltered with slip-proof, noiseless protective rubber housing, along with webbing to give the set the perfect firm grip in any and every weather conditions, be it in the cold, heat, rain, sea water or excessive sun’s rays. Moreover, the unit comes with additional protection against environmental damages. These pair of rangefinders are ultra-durable and sport an unbreakable Makrolon inner housing that can deal with the harshest demands while keeping its weight low. The tremendously resilient military-grade design can cope with the most severe shocks and vibrations all the while guaranteeing stability. The set also boasts of an additional feature of having nitrogen gas inside the binocular, which eliminates fogging and mold on internal lens surfaces even under extremely severe conditions including those of rainstorms and high humidity. The lenses of the unit have BAK4 Prism on it, which features a bright, sharp image with vivid contrast to offer and view every little detail of an object. BAK4 prism systems create a perfect three-dimensional image, and its construction increases light transmission. The ATN BinoX-HD 4-16x/65mm Binoculars is one the most advanced rangefinders in its class. Its most advanced feature is that of the Day and Night mode in HD resolution which allows the customer to take shots in color at high resolution with no danger of any blurry images. The set is also considered a Smart Rangefinder because of its built-in feature that allows the customer to range the target without carrying additional equipment along with calculating the distance of an object from the point of viewing. Additionally, the unit boasts of a 3D Gyroscope as well as an E-compass. The binoculars have a gyroscope built into them which allows the customer to keep images steady and blur-free, while the smart e-compass helps in navigation by pointing to the destination. The unit also has the advanced feature of E-Zoom, which lets the user magnify to target without losing what’s in the FOV like with step zoom systems. These rangefinders have 1080p HD Video Recording & Photos, Wi-Fi Streaming – allowing the user to record all of their hunting trips, using their phone or tablet or other digital devices as a viewfinder. The set uses 3 CR123A high-quality Lithium Batteries for better performance. Also, all of the firmware of the binoculars can be upgraded according to requirements and wishes of the customer. The Vortex Optics Fury HD 10×42 Laser Rangefinding Binocular is high quality and low-cost product. The set provides the user with convenience, speed, efficiency, and valuable dual-purpose functionality – all the advantages of a high-definition binocular perfectly paired with an angle-compensated rangefinder. High-quality optics along with long-distance ranging capability also come together in this set. The right side controls of the unit are simple to use and easily manipulated with a single hand – leaving the other hand free to hold another important piece of equipment. The Fury uses HCD (Horizontal Component Distance) angle-compensated ranging technology distance that is ideal for the majority of hunters and shooters with either rifle or bow. Also, an advanced LOS (Line of Sight) mode provides the option to calculate long distance, high angle shots with increased precision. The unit is also blessed with a scan feature that gives continuous range readings to pan across a landscape or tracks a moving target. There are three brightness settings to keep the display visible in various lighting conditions, while a battery life indicator is always visible on display. This rangefinder has the advanced benefit of being XR fully multi-coated and having HD lenses along with dielectric phase-corrected prisms to serve up clear and impressive views from dawn till dusk. The outer shell of the binoculars is nitrogen purged to make the unit waterproof and fog proof, along with an armored rubber housing for a solid grip. This provides the binocular with an advantage to stand up to extreme weather conditions. 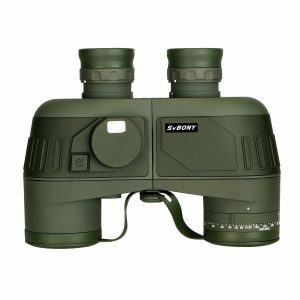 Made for marine as well as terrestrial observations along with support for all outdoor activities and water sports, the SVBONY SV27 Military Binoculars 7×50 is a rangefinder designed to meet military standards, making it work well even in the most demanding conditions. The unit is provided with 7x magnification and 50mm objective lens which is the marine standard for a wide and stable image for various activities like boating, fishing, and even for buoys and bridge numbers be it in smooth or rough waters. The set boasts of having IPX7 waterproof fogproof completely sealed Nitrogen gas which is used to eliminate fogging, mold, moisture, dust as well as debris on internal lens surfaces even under the extremely severe weather and climatic conditions. The lenses of the binocular set are covered with Premium Bak4 prism with high transmittance for sharp images, making it easier to see more details of the targets with vivid contrast, brightness, and saturation. Last but not the least, the binoculars are equipped with a rangefinder as well as a compass. The unit has a switch for the internal illumination which indicates the distance, size or direction along with the location of the objects being viewed. The set requires 2 CR2302 batteries for operation. Whether you are going on a whale watching trip or going to hunt in a wet environment, you’ll need a pair of binoculars that is waterproof, has the rangefinder function, and can last through a lot of abuse. As the information that you get from a rangefinder binocular can help you in a lot of situations, we highly recommend that you get one today, so that you can record your observations a lot more accurately and so that you can hunt a lot more efficiently. If you are stuck on a few products because there are so many great-looking choices available, we recommend that you choose one of the binoculars we reviewed above, as they all passed our strict criteria and we highly recommend them as experts in this field.